A'PEX's answer to the constraints and limitations associated with most piggy-back style fuel controllers. The Power FC is a complete, stand alone, total engine management system capable of handling virtually anything thrown in its path. From multiple point fuel and ignition control to VTEC engagement (Honda applications) and boost settings, the Power FC is capable of accommodating even the most demanding performance enthusiasts. The Power FC replaces the factory ECU and controls all engine parameters. (Off road use only, no OBD-II) Installation is as easy as replacing the factory ECU. (Some minor rewiring is required on select vehicles.) The factory engine harness does not need to be replaced and all critical accessories such as air conditioning continue to function. By using the optional FC COMMANDER, the user can adjust and modify a wide range of settings. 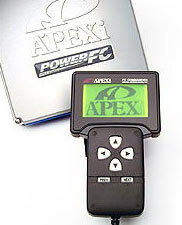 By changing various parameters and data, the Power FC will adapt to any of your performance needs. Since there is no need to upgrade ROM chips or trade in ECU's, the factory ECU can be kept by the original user.